So I escaped from Alcatraz. It took me 35 minutes to swim from The Rock and 2:49:07 to complete the course. The water was very choppy, salty and around 55 degrees. It was a challenging swim, but overall not as bad as it was made out to be. There are a lot of logistics to get ready for the race. It is different than Ironman, but just as complicated. The morning preparations necessary for the race is an extra layer that other triathlons don’t have. We needed to be at the transition area around 4:15am in order to setup our transition site. Then you had to drop off a transition bag for the ½ mile run between the swim exit and bike transition. Then you needed to have another bag ready to drop off inside the boat that takes you to Alcatraz. This bag contained all of your warm clothes that you would wear before the race. To get on the boat, you needed to board a bus that took you to Pier 3, where you got body marked and had to wait for the boat to start loading. It was a lot of moving around and activity even before the race began. While going through all of this I started to think that I am glad I am doing the race now, but this might be it for me. It all just seemed a bit much. However after the race, that feeling completely left me. It was a spectacular and fun course and I highly recommend it. Once we got moving on the boat, we were treated to a wonderful view of San Francisco. 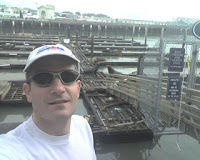 We then circumnavigated Alcatraz Island. This was a treat, because on the tours of Alcatraz, the boat doesn’t do that. While looking towards shore, they announced over the PA system the landmarks you needed to swim towards. You don’t swim on a direct line to the exit, since the current pull you towards it. If you were to swim a direct line, you would most likely wind up shooting past the exit and need to be fished out of the water. Instead you were directly towards shore, instead of along the length of it. I think I overcompensated a bit as I found myself to the left of many swimmers throughout most of the swim. To exit the boat we were told to storm off of it like the army storming the beaches at Normandy. They would call your wave and everyone made a mad dash off the boat by jumping into the water and immediately started swimming. At the race briefing they told everyone that once you were in the water, you should stop and take a look around to see where you are. 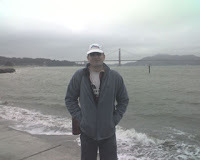 I did do that and it was an experience to see Alcatraz only yards away from me from the middle of San Francisco Bay. I didn’t linger for long. The sea was rough, there were swimmers all around me and the water was cold. My plan was to pee in my wetsuit once I hit the water to warm up, but the shock of suddenly being out in the open water made the urge disappear – In truth, I forgot all about peeing until I was about halfway across. By then it was difficult to let it flow, but after slowing down and concentrating I was finally able to get it out. 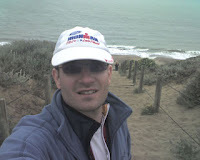 Here is a picture of me by the swim exit the day before the race. I must say the cold water swimming experience I got with my Cibbows friends really paid off. It was reassuring to know how my body would react to cold water. I think my previous cold water experience paid off and my hands and feet never really got so cold that they became problems. The part of the course I was most intimidated by was the bike. I had previewed the course by car the day before and I was concerned with the hills that we had to tackle. They were constant and steep and you really couldn’t get any momentum to carry you over them. One particular hill was very steep and I asked my companions in the car (who have done it before) if they saw people walking their bikes up this hill. They said they did see people walking up the hill, albeit with great difficulty since their pedaling cleats would keep slipping on the hill. I saw one person trying to walk up the hill when I reached that point in the race. Even though the course had hills, you were never really able to take advantage of the downhills. Every downhill had many turns or was on a rough road. Even the flat sections, it was tough to get aero, since the road was so rough. On a particularly rough patch I thought I was going to lose control as I struggle to go from aero position to my handgrips in order to maintain control of my bike. It was difficult to pass as well since the course was narrow and also an out and back. That is cyclists were also heading right towards you just on the other side of the street. The last couple of miles of the course were downhill leading into a flat section, so I was able to make good time back into transition. 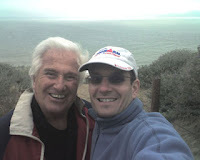 When I arrived at my transition position, my father was right next to me on the other side of the spectator barrier. It was great to see him there cheering me on. My favorite part of the course was the run. This was also and out and back course, much of it on narrow trails with the return runners passing right on the same path. You could help but graze against many runners as the headed in the opposite direction. I felt like I ran really well right from the start, even though my feet were a bit frozen. During the first mile or two, it felt like I was running on top of frozen rods along the length of my feet. It took a while for my feet to warm up and get a real feel for the ground. The course went through some wooded areas, up and down stairs and through a tunnel with a low clearance. The tunnel was crazy as not only did you have to watch your head from the roof, but it was impossible to see the ground since it was so dark. The best part was when you went out to run on the beach. Everyone ran along the hard packed sand near the water line and would dart back towards the sandy part of the beach every time a wave would come in. The famous sand ladder that everyone talks about was kind of an anticlimactic part of the race. Everyone walks it and it wasn’t that bad. It was tough, but since you walked it wasn’t horrible. After the sand ladder you started heading back for home on some really narrow trail. It was difficult to pass people as runners were also heading towards you from the opposite direction. You had to be able to turn on bursts of speed to get past people when you had the opportunity. Usually the person in front of you would be accommodating with you yelled out that you wanted to pass. That was the case except for one person in front of me who didn’t seem to want to let my by. Finally I yelled to him passing in a loud voice to which he replied “are you kidding, just deal”; that’s when I told him I wasn’t, put on a burst of speed and flew past around 6 runners in front of me. When we came out of the trails we had about 2 miles left to go. I started running flat out, pushing my heart rate into the red zone. It felt great and horrible at the same time, but I didn’t let myself slow down. I wanted to see how much I could make it hurt and how long I could last at that pace. I was able to hold it all the way across the finish where my father was waiting and cheering for me. I too vote it was a excellent race report.